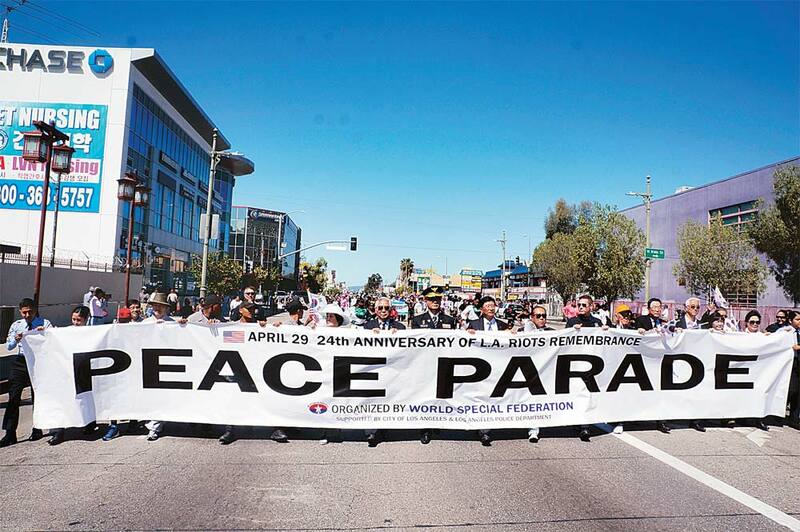 Peace Parade with the hope of racial harmony was held in remembrance of the 4.29 LA Riot back in 24 years ago. World Special Federation, Korean Consulate in Los Angeles, The National Unification Advisory Council (NUAC) in LA, 3.1 Women’s Association in LA, and 30 other Korean American organizations participated in the Peace Parade that was held at Seoul International Park which is located in the heart of Koreatown. These Korean organizations showed their hope and will to overcome the pain that was caused by the LA Riot and improve the cooperation between the Korean and African American community. Also, the Peace Parade entertained the eyes of participants of the parade. Kim So-Yeon Gloria Dance Team, Kids Tae Kwon Do Demonstration Team, West Angels Kids Dance Team, Boys Two Gentlemen, and Most Motor Rised Bike Club performed at the parade. Chairman John Kim from World Special Federation that organized the Peace Parade said, the parade was for providing motivation to heal the scars that were caused by the 4.29 LA Riot and need to strengthen harmony among different races. Chairman Kim also said he hopes The Peace Parade would be organized every year and that the all ethnic communities will foster value of forgiveness, tolerance, and love. Los Angeles community leaders, office of LA’s fourth district city council member, David Ryu, LA Fire Department, and LAPD Olympic Police Station also made appearances at the parade and supported the Korean-African American community. Chief Deputy Emile Mack from LA Fire Department said that he is pleased to let the public know that Korean, Latino, and African American communities are getting closer thru participation in this meaningful Peace Parade. Deputy Mack also added that we are all ‘Angelinos’ although our races may be different. About 300 people including the leaders from Korean and African American communities and LAPD officers walked together along the Normandie and Vermont Ave raising their voices in unity.